This article was written by Ellys Cartin, Mads, Darthlocke, Sam Dinsmoor, and Nirat. Article edited by Donna Cromeans (@DJRiter). Article prepared for publication by Aimee Hicks. "The children around our house have a saying that everything is either true, not true or one of Mother's delusions." Shirley Jackson spoke in jest when she wrote that quote in a nonfiction essay about her own life, how she would lose herself in creating stories. At the heart of The Haunting of Hill House, adapted from Jackson's beloved and chilling story, is Olivia Crain---a mother who may or may not be delusional. She falls victim to the dark forces within the house, but her desire to protect her youngest, most helpless children only grows. Through eight episodes, viewers witnessed only snippets of who Olivia was. "Screaming Meemies" finally pulls back the curtain, revealing truths even more beautiful and horrible than expected. The episode rests entirely on the performance of Carla Gugino as Olivia and how she portrayed the character as absolutely loving and absolutely dangerous at the same time. For this outstanding accomplishment, she has been selected SpoilerTV Staff Choice Performer of the Month for October. "Screaming Meemies" begins with Olivia awakening. At first, the only thing visible is Gugino's eyes. They do not convey sleepiness or disengagement or anything natural to being awakened unexpectedly. Together with the set of her mouth, her expression is cold, as if she is deep in malicious thought. This makes it a surprise when the camera pulls away to reveal Olivia is snuggling with her sleeping twins, Luke and Nell on the couch. Her character's husband, Hugh offers to help carry them to bed, but Olivia refuses. Gugino's facial expressions are completely different here, Olivia is relaxed, her eyes are happy. Hugh asks if Olivia’s arm is asleep. Still adrift in her soothing reverie, Olivia shakes her head, saying no. Gugino lets Olivia’s face glow with maternal pride here. She doesn’t mind a little discomfort if it means holding her babies close a bit longer. But then she looks down. Her arm is empty. She’s startled. There’s a visible, brief moment of panic as Guginosignals Olivia’s fear with a frozen look on her face. She looks down in bewilderment at her now-empty arm, which is sprawled out limply on the couch. Hugh has Luke in his arms. He had picked him up despite her protests. In a particularly brilliant ten seconds, Gugino portrays three different sides of her character. First, there’s the sting of betrayal that Hugh didn’t listen to Olivia, her eyebrows and forehead tighten. Second, she demonstrates anger as her chest rises and falls quickly a couple of times, and her mouth almost slides into a frown. Third, she pretends everything is fine. Fixing a swift smile on face as she tells Hugh she’s coming. But in the same instance almost as if it’s a reflex, Gugino has Olivia halfway make a motion to put her arm around Nell, as if to protect her. And while Hugh carries Luke like a sprawled-out rag doll, with the little boy’s head and legs swinging about...Olivia bundles up Nell gently, supporting her legs and nestling her head in the crook of her mother’s arm. During a previous episode a storm, which seemingly broke several windows on the house, Nell had disappeared causing a frantic search by her parents. They found her, though the experience particularly shook both Nell and Olivia. In this episode, Olivia approaches Mrs. Dudley who is cleaning up the broken glass and shares how storms bothered her more when she was younger, She relates an incident that happened shortly after Olivia's father died unexpectedly in a car crash. As she's talking about how she couldn't grieve right away back then, Gugino tells the story as if there is a lump in Olivia's throat. She doesn't look directly at Mrs. Dudley. She just looks past her towards the left or right, occasionally pausing to take a deep breath. Olivia does make eye contact when she goes into detail about what did happen (coincidentally...or not) when her childhood self finally did grieve. As Olivia talks about how the hail fell as she cried, Gugino adds a tone of awe into her voice, as if it's a peaceful memory. But then when Olivia starts talking about how the hail was harder the more she cried and how it broke a window, Gugino has Olivia detach and basically just tell the story to herself, getting lost in it, watching her own hand gestures more than Mrs. Dudley's reactions. Viewing it without the eerie building music just shows more of how she shapes this scene too. She's turning her head a bit too fast, looking to this side and that side, widening her eyes to punctuate each sentence. Her voice drops to an absolute hush as Olivia finishes recounting her story. She shifts her mannerisms once more, as Olivia realizes that what she just said could be viewed as far-fetched. The storm and its aftermath becoming a distant thought, Olivia goes to her reading room. It’s a rare glimpse of Olivia enjoying a bit of alone time, and Gugino highlights how relaxed Olivia is through her pleasant mannerisms and comfortable rituals. She carries a pot of tea and a teacup into the room, climbing into the chair and curling her legs up next to her. She watches the tea pour out with an expression of happy satisfaction. She puts the teapot down with her right arm, but the left arm remains upright as her hand makes a subtle flourish. Olivia is feeling fancy. She opens the book, holding it in one hand with the teacup in the other. Of course, she blows on it first to cool the tea, but then the pain hits her. 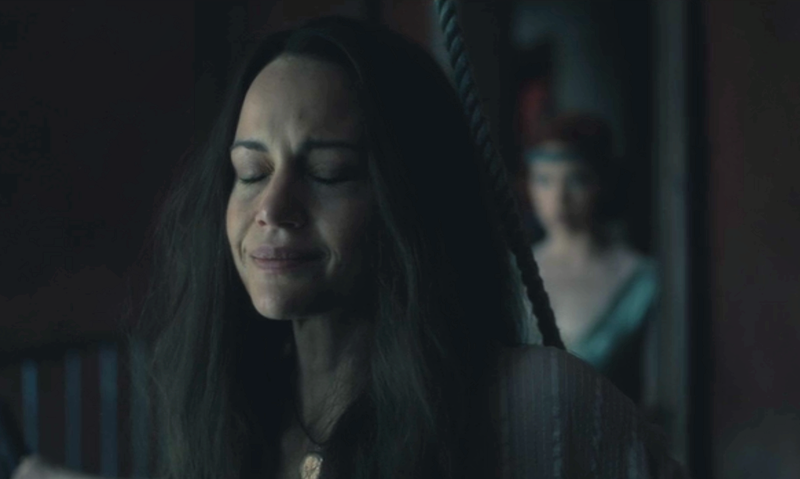 Gugino’s Olive closes her eyes tightly, wincing and grabbing at her forehead. She goes to the kitchen for water, barely acknowledging Luke and Shirley squabbling. Getting the pain under control is all that matters. Olivia returns to her reading room, opens the door, and her face is shown first before the room which is now a morgue. She’s perplexed but not worried. Still, she partially turns around to leave but looks back to see that there is now a body on one of the tables. Gugino walks straight toward that table but moves very slowly, the closer she gets the more nervous Olivia becomes. She gasps, and her eyes quiver as Olivia feels the horror of what she’s seeing. Recognizing Nellie, her entire face shakes. She quickly steps back, her whimpering slowly building. Her eyes wobbling with tears. Terror and sorrow play out in equal measure, and Gugino juggles them with ease. She is shaking all over as the vision of Nellie sits up on the table. Her pupils could not be larger. And then Olivia falls backward into reality. The actress leaves us with Olivia trying to breathe normally, brushing away her tears, and returning to her chair. But she doesn’t curl up this time. She sits on the edge, with her back only slightly bent forward. Gugino shows that Olivia no longer feels safe and comfortable in this room. When Oliva tells Hugh about her vision. Gugino does a couple of small things in this scene that maximizes its emotional impact. First, there's how her courage wavers when she says the twins' names. Her son's name is almost a whisper, with her upper lip and her voice quivering when she says it. But when Hugh comments on what a horrible dream it must have been, Olivia chooses to think of it as just a dream too, other than a passing comment about how vivid her dreams have been. She gives Olivia barely a breath to look away from Hugh and compose herself, turning her attention to his injury instead. And yet, even as she gives him a lighthearted goodnight kiss, her shoulders never relax. One of the most important scenes in the episode is when Olivia meets the ghost of Poppy Hill. It is in this scene Olivia comes to the horrific realization that the only way to save her children from the horrors of the world is to kill them. Poppy tells her stories of her own children and husband who were suffering and to "wake them up" from these horrible nightmares or, screaming meemies, she snuffed them out. When we first see Gugino in this scene, the wear and tear of the house are immediately visible. She evolves with Olivia and with Hill House itself. It can't be easy to portray a character undergoing season long mental deterioration, especially when many of the factors influencing her downward spiral are invisible to all others. Gugino gives a very personal, internalized performance, her torment within the walls of the house centering on dormant fears of what the world will do to her kids, particularly the twins, who are the youngest. Much of Olivia's story is separate from the rest of the Crain's journeys. The way she is able to shift, almost imperceptibly, from sorrow to elation (when Poppy brings her to the twin's bedroom), to desperation over the fact she may not be able to save Nell and Luke from these horrid dreams to a final note of determination, is masterfully done. Poppy's ghost could be a manifestation of Olivia's fear as pertains to the twins. She coaxes Olivia towards the ultimate answer: death, disguised as protection. One could immediately sense the final stages of madness in Olivia. Her eyes are glazed, swimming, and unfocused on her surroundings. A lesser actress could have overplayed this; it would be easy to overact. Gugino's ability to be subtle and allow her performance to build into the dramatic crescendo later in the episode is what makes her so skilled. Olivia is reaching her breaking point and slowly being swallowed into the pit of the house. 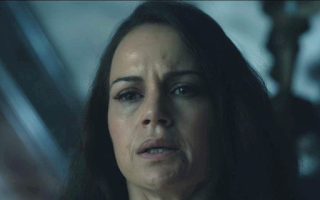 The house is distorting her sense of reality with these hallucinations, and as Olivia's sanity disintegrates, Gugino's superior ability to take this character to that place becomes more apparent. When she wakes up on top of Hugh with a screwdriver to his throat, having believed she was just talking to Poppy, she's terribly shaken. Olivia has no idea what's going on and the way Gugino presents her confusion and fear is wonderfully done. The sweat glistening on her face, her breathing panicked. Somewhere deep down, Olivia knows it's more than the nightmare she says she's had to placate her husband, but she's too scared to admit the truth. She's losing herself and she's partly aware, but the house has her too confused by manipulating her emotions and worst fears. Facing another one of her unexplainable actions with the messed up plans she drew up, Olivia becomes even more broken. She knows something is wrong and that she should probably leave for a little while, get away from the house. 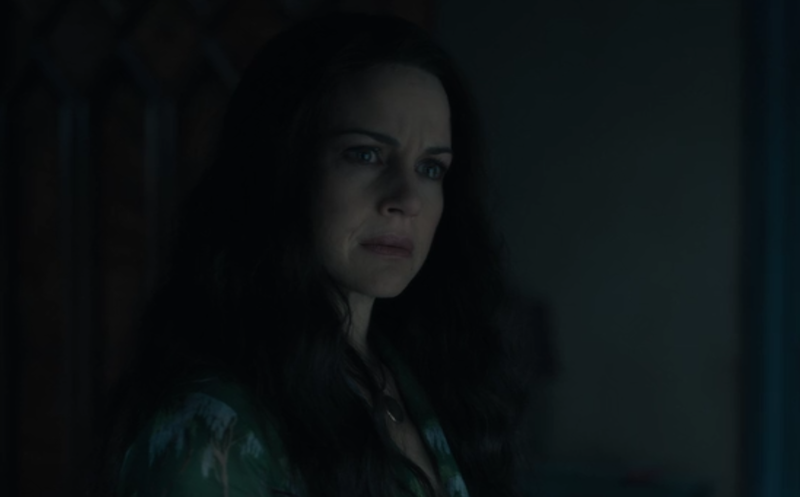 Gugino's crying, scared, and nervous face has one feeling nothing but sorrow and sympathy for what this mother is going through. Tears falling down her face, a completely defeated look in her eyes, she shows the signs of a woman on the edge and tipping over. But, she recovers herself enough to try to be strong, determined to stop whatever is happening and get things sorted out for the sake of her family. 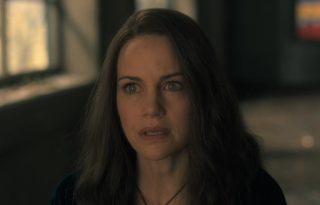 As she moves through the house after these ordeals, the sounds of everything around her banging into her head, Gugino's tired, stressed-out look, shows she is just about to snap from it all. By the time she puts her twins to bed, she's covered all of her problems up enough to give her kids the comfort they need. That is until they go on and on talking about the turbulent lives they're going to lead in the future; Luke's with his future drug addiction and Nell's future depression, anxiety, and sleep paralysis. As Olivia listens intently to them, Gugino is acutely tuned in to what they're saying and shows a mother confused and horrified by the twisted things her kids are saying. She can barely speak above a whisper in response to it until the house forces the resolve out of her loudly that she would never let anything happen to them. That she would wake them up from such a bad dream. Gugino is hauntingly, beautifully taking this woman from this relaxed, loving mother to this unhinged, obsessively protective mother that one that will protect her little ones at all costs. In a second conversation with her neighbor, Olivia hears some things but doesn't fully take them heart as Mrs. Dudley tries to ground Olivia and prepare her to fight for her children. Here, Gugino is again able to show a kind of elegant reserve or elusiveness with a somewhat softer voice and shrinking violet demeanor but retains a sense of poise. Hair, unkempt, like her mind, she continues to paint a vivid picture of a person falling further into an abyss desperately trying to get out. Hugh is unable to comprehend the true reality of the situation saying she's tired and stressed. What is happening is Gugino showcasing a tour de force of emotions, each word, content, exhausted, nervous, creative, all the things, each had an expression, poignant, that built towards a canvas of suffering that she exquisitely, and effortlessly exhibited. The fact she's questioning her own sanity, turning her head to the side, looking for assurance from her husband is excruciating. Hugh trying to form the right words sees Olivia react like she's clinging to his every word. She's holding onto him as her lifeline. She's looking longingly for help in his eyes, and as he walks over and grabs her hands and kisses them the camera pans up and her expression breaks hearts. Like any mother, she puts on a brave face and agrees to leave early but still worries about all the things Hugh must worry about. She never worries about herself. 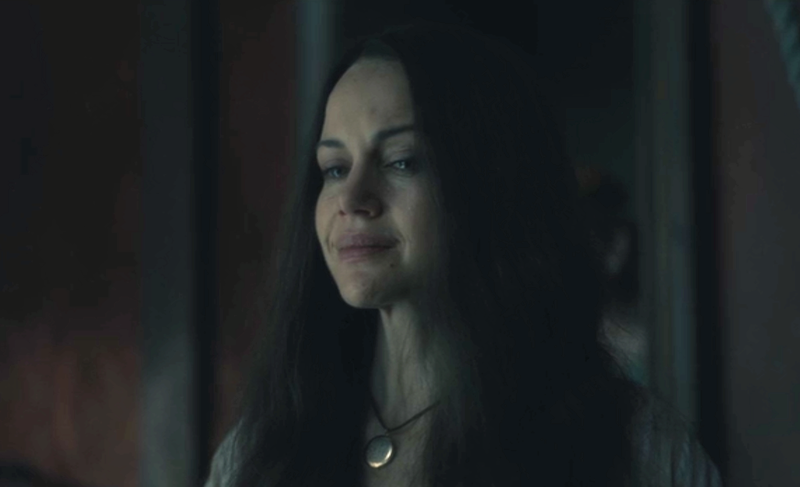 She cries, eyes closed and a wide opened mouth that shatters your soul before looking at Hugh again, in such pain as Hugh tries to offer her comfort. Every time she looks at Hugh, she tries to keep it under control, sniffling and containing her tears. She puts on the face of a warrior and trying to protect others from being hurt because she doesn't want to burden anyone. Olivia regains her sanity enough with the help of Hugh to make the decision to leave for a while, to take a break from the horror of the house. As she always is with her babies, she's staying strong for them so they don't worry, acting completely normal. But from the look on Gugino's face, you can tell that there is so much more going on underneath. As she leaves, and Luke follows her and asks her if Abigail can spend the night, the way Gugino smiles sweetly at her innocent son and tells him he can, is so warm and comforting the trouble she's facing is forgotten. She seems as calm and as confident as she ever has since moving in, here as she takes a last look at her kids, certain that she's going to make herself better for them. Olivia’s farewell to her children with its forced bravery and cheeriness gives way to the very different tone of her telephone call. The scene switches from Hugh’s end of the call (with the chaotic noise of the children dominating the background) to Olivia. She’s sitting in a dark room, definitely not Aunt Janet’s. 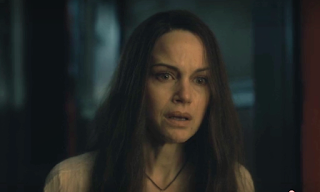 Gugino has very little dialogue in this scene, but she uses her body language and tone to convey the alien transformation that has occurred within Olivia. She sits absolutely straight. Rigid, inflexible. She even holds the phone straight. There’s barely any inflection when she says, “It was fine,” as Olivia lies about her flight. But when Hugh pauses to berate the children, she inhales sharply twice. Olivia continues the ruse that she’s at Janet’s, as she listens to the noise of the children arguing over the phone. Her voice wavers once. When Olivia hangs up, she exhales once, sitting cross-legged on the hotel bed, shoulders and arms and torso completely straight. There isn’t a trace of vulnerability. She replicates this demeanor for the next scene when Olivia returns to Hill House. As she stands and watches Hugh asleep on the couch, Gugino has stripped away every human part of the character. She just tips her head slightly to the side, examining him with a faintly puzzled expression. It distinctly reminds you of how an android would consider some curiosity. It isn’t meant to be natural, but the impersonal darkness that Gugino has in her eyes is what makes this moment disturbing. Finding Olivia in the kitchen is the ultimate warning sign. Everything about her screams that something is not right. From the moment she goes downstairs, and the camera focuses on the bottle of rat poison, to Shirley questioning why her mother is milling around in the middle of the night when she's not even supposed to be home, Gugino plays Olivia as being a million miles away, mentally. In a masterful moment, she makes it appear that while Olivia is there physically, it is apparent in her eyes that she is under complete control of the house. At this point, she is already a ghost, from her gossamer white robe to the way she glides through the house and corrals the children to follow her. 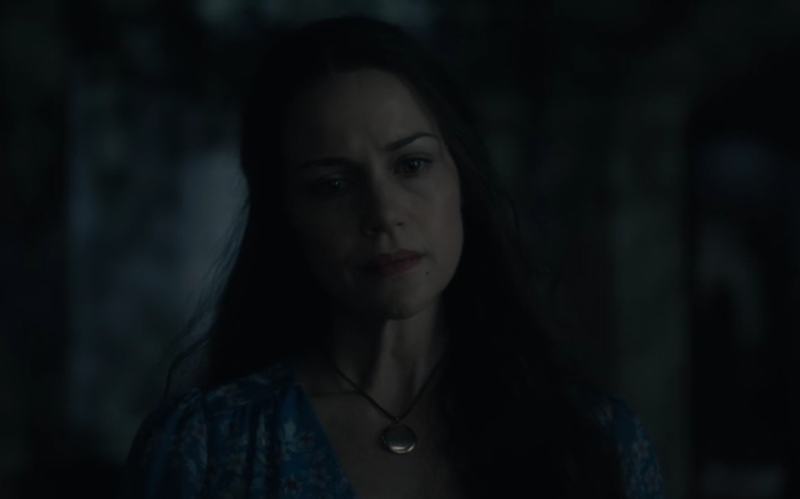 The way she talks to Nell and Luke would presume nothing is wrong, but there is a carefully woven note of eeriness in every line Gugino speaks. Even when she looks upon Abigail's face, you can see in her eyes the resolution to save another little girl before it's too late. She made a point of telling Shirley that she, Theo, and Steven had "grown up so fast", therefore they're beyond being saved. But the children are not. Even as she herds Abigail, Nell, and Luke to the Red Room, she walks with uncanny grace. For one unsuspecting, this could be a regular mother trying to have a fun night with her kids, but when you look closer, it's apparent how Gugino has altered the smallest aspects of Olivia's personality and demeanor to demonstrate her descent into insanity. The Olivia of the beginning of the season was firmer and more grounded whereas this version of her almost seems like she might float away. Her gaze is unfixed, her posture relaxed, she has only one goal and I can see the fog of her mind through the blankness of her eyes. She shows how Olivia has relinquished control to Hill House and thus her invitation to the tea party is truly a march to their deaths. The tea party begins with one clear goal, making everyone safe. Only a mother would warn their child it's "still a little hot", trying to prevent them from being burnt. Regardless of the poison, it's this act that shows she's not truly malevolent. As Olivia passes a teacup to Nellie, she says, "your cup of stars", with attentive eyes and a wide smile, slightly reminiscent of the Chesire Cat from Alice in Wonderland. It's this slight exaggeration in expression that's not quite as nuanced as previous smiles conveying the sense Olivia isn't fully in control of herself. She's being twisted by the will of the house and over the course of this tea party, widened smiles, help convey that. A child wouldn't quite pick up on this but there is something there, that's not quite human. Olivia asking them to wait so she can pour herself a cup so that they can all drink together is another act of a mother's love. It's mortifying to think this was her last moment of happiness and she didn't know it. Her steadfast belief that she's doing the right thing never makes her raise her voice or get angry at her kids. She doesn't want them to suffer even though life and death aren't free of pain. The fact that Abigail is foaming at the mouth and Olivia is so put together, so sure that she'll wake up is another testament to the power of belief. Gugino sells this harrowing scene perfectly, where she's so lost in wanting to save her children, to wake them, that she doesn't realize what it costs. It's as if she's trapped in a mirror, what she sees she believes is fantasy, her fragile mind has taken advantage of by both the house and Poppy, prevents her from seeing the truth right in front of her eyes. In an echo of the opening moments, Olivia wakes up alone in the Red Room, without the twins. She is injured from Hugh fighting her off, but she still runs limping through the house looking for the children. Here, Guginomust display more physical acting, showing Olivia's pain and confusion in the way she stumbles around, slightly off balance, with her arms reaching out wide like she's playing Blind Man's Bluff. A shut door presents itself. Olivia grabs the doorknob to keep herself from falling. She is completely silent outside the door, hesitant to open it. Perhaps not even wanting to. Perhaps realizing something is wrong. We know this, because Gugino tells us, in the way she stands a bit straighter and doesn't attempt to push on the door. She acts like she doesn't know how to turn this particular doorknob. It is heartbreakingly clear Olivia is awakening too late to the true danger around her. She runs, falls, crawls, runs, falls, and crawls again trying to catch up to Hugh as he flees with the children. Hurt and alone Olivia shuffles back towards the Red Room. Upon finally reaching the doorway, Olivia drops to her knees, mortified to see Abigail's lifeless body on the ground. She crawls towards the child in shock from the realization she might be dead. At the realization that death has come, Olivia wails, devastated. Gugino pours staggering energy into Olivia's despair, her entire body shaking, overwhelmed with emotion. Each wail becomes louder than the last, more imbued with agony. It's this cry of a mother's love that is felt so deeply, so genuinely. She gathers her composure and questions if the Abigail she sees, standing wide-eyed, in the doorway to the Red Room, is awake. She then gathers her strength, reaching for the table to pick herself up and limps out of the room, instead of following Abigail, she walks towards the perilous staircase. Seeking for guidance, Olivia turns her head around, lost and alone, vulnerable, pleads to wake up. Underscored by a heartbreaking musical piece that crescendos as Olivia cries, she begs to wake up. Gugino squeezes her eyelids tight as if when she opens them this nightmare will be nothing more than a dream. The conviction to this performance is impeccable, even as her next words change in tone as if to indicate further hope of waking up. It is devastating to watch the scene play out as the camera shifts to a side profile of Olivia's face as she asks why she can't wake up., Her eyes for just a moment, look up towards the ceiling as if to call out to a higher power. As the score become overbearingly, terrifyingly loud, she lets go of her hold on the railings. With both arms spread open, like a bird flying out of misery she flies as the camera pulls away to show the railing, the cold, isolated house and then, the cruel snap landing of Olivia's tragic fate. The episode ends with a reminder of who Olivia was. It's the day the Crains moved into Hill House and everything about Olivia in stark contrast. Her hair is neatly pulled into a loose ponytail. Her voice is cheerful, eagerly directing her children on where to find things. She's not wearing the locket with Luke and Nell's pictures, but a simple gold necklace instead. Here Gugino portrays an Olivia totally at ease. Her body is relaxed excited about this new project, for the "endless summer" ahead. She even has her hands in her pockets. 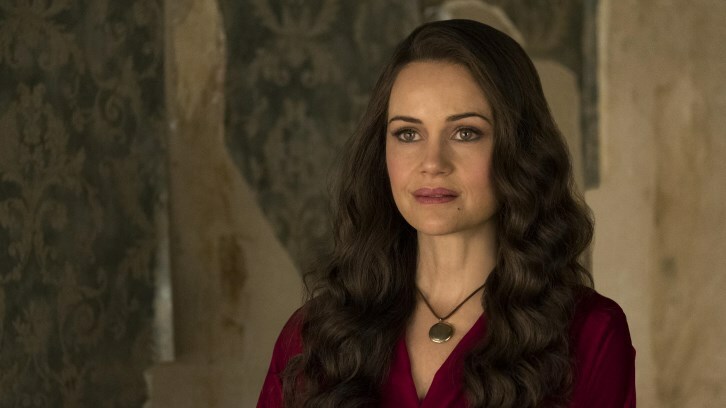 The Haunting of Hill House certainly could not have gone on without Carla Gugino. The best horror is rooted in the most compelling tragedy. Watching her Olivia Crain step closer and closer to destroying those she loved most while thinking she was figuring out how to save them is as tragic as it comes. For the loss to truly hurt, the audience had to love Olivia as her family did. Gugino gifted Olivia with a radiant, generous spirit and a strong, fierce character. And it fell to her to convincingly erode the trust in this amazing woman, to chip off little pieces of her character's mind and soul in each scene. She made us simultaneously relieved and heartbroken when Olivia's plan failed. The ghosts, the shadows, the eerie score, the jump scares, the cries -The Haunting of Hill House had all these things. 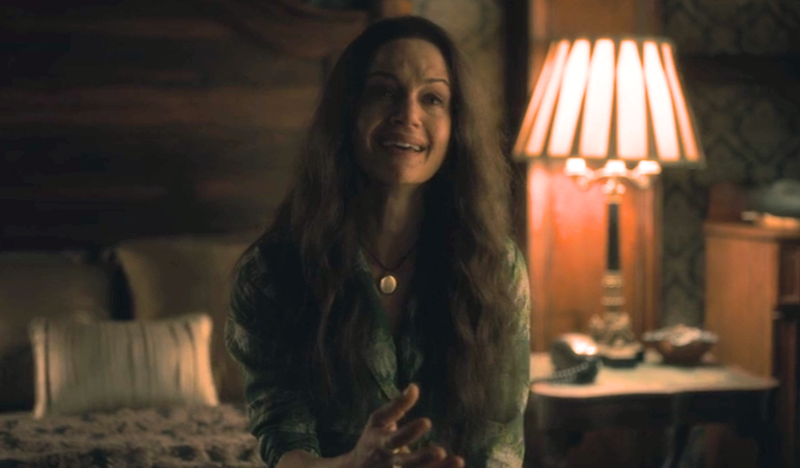 But, nothing and no one will haunt viewers like Olivia, thanks to Gugino's brilliant performance. 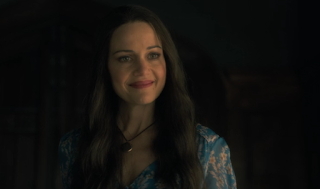 For all the reasons noted in this article, Carla Gugino of SpoilerTV's Staff Choice Performer of the Month. Please use the comments to discuss her performance in this episode and regarding her portrayal of Olivia in The Haunting of Hill House.